Following our fifth year of fundraising we are pleased to announce that the 2016 events raised £17,400 for Aberdeen FC Youth Development. This brings the overall total up to £118,150. As fanatical supporters of Aberdeen Football club the directors’ decided in 2011 to attempt to raise funds for Aberdeen Football club’s youth development programme. With every penny a prisoner in Scottish football and budgets under increasing pressure we took the view that the only way in the foreseeable future that clubs could prosper was to produce their own star players and to sell these onto better funded clubs in England and to effectively trade their way out of the financial conditions being endured. We started with a sports quiz in 2011 and then held our inaugural corporate dinner in 2012. Stand Free Youth Development was able to hand over a cheque of £17,000 to the club which secured the services of three young players they would otherwise have had to let go. In 2013 another sports quiz was held and the second corporate dinner was held on 11 May 2013, the thirtieth anniversary of the club’s greatest success when they defeated Real Madrid 2-1 in the European Cup Winners Cup final in a rainy Gothenburg. Stand Free Youth Development were able to hand over a cheque to the club of £38,750. Aberdeen Football Club remains the only Scottish club to win two European trophies. We are determined in our own small way to assist in any way we can to help them find the next Willie Miller or Neil Simpson. 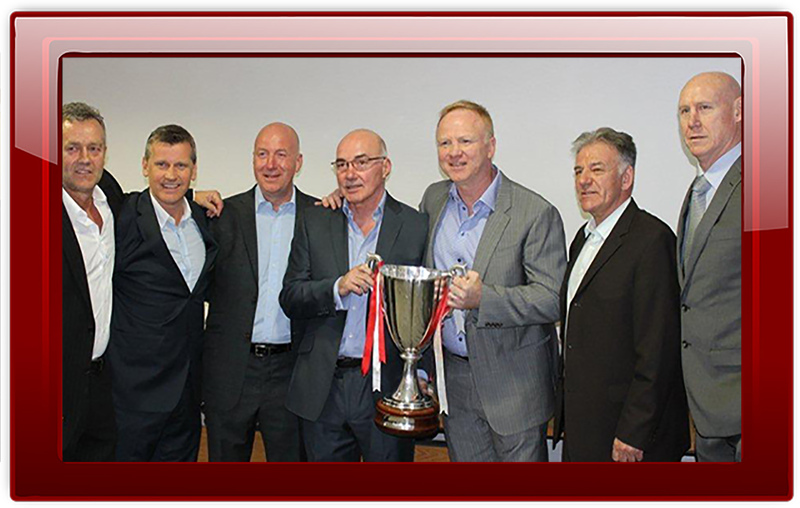 In 2014 other successful events has seen a further £25,000 raised for Aberdeen Football Club’s Youth Development Programme. This brings the combined total handed over to the club to £80,750. The 2015 events programme is well under way, so watch this space. Following the 2015 quiz and dinner we handed over a cheque for £20,000 to Neil Simpson Head of Youth Development at Aberdeen Football Club. In the four years that we have been operating we have now given to the club £100,750. Thanks to all who supported us in what has been a very difficult 2015 for the North East of Scotland. Although Aberdeen and Aberdeenshire has experienced extremely difficult trading and financial times we were still able to hold our annual fundraising quiz and dinner. We handed the club a cheque for £17,400 in July 2016. This brings the five year total of monies given to AFC Youth Development to £118,150. In 2017 we held our 6th and as it transpires our final quiz and fundraising dinner events. In the six years we were in operation we are proud that we helped to raise £136,150 which went directly to assist Aberdeen Football Club’s youth development programme. With the crop of young players now coming through from the club, we have a small glow of satisfaction that we played a small part in their development. We are happy now to hand the baton over to those who in the future will hopefully continue to show support to the club.